Cal Fire is dispelling rumors surfacing in San Luis Obispo County that arson is suspected in the recent rash of vegetation fires. The agency has released preliminary causes for four recent fires, three of which were reportedly started by vehicles. Fire officials are still investigating some of the recent blazes and have yet to release final reports on any of the local fires that broke out over the last couple weeks. However, Cal Fire says there is no evidence to support arson as a cause of any of the recent fires in SLO County. The Hill Fire, which ignited late last month in Santa Margarita and destroyed the ranch of actor Johnny Galecki, burned 1,598 acres and destroyed four homes. The blaze was caused by a vehicle fire that spread into vegetation, according to Cal Fire. Another car fire that spread into vegetation ignited a blaze last Friday on the Cuesta Grade. That blaze, dubbed the Tower Fire, burned 68 acres. A more recent fire in Santa Margarita was caused by mechanical equipment that was being used to clear brush, according to Cal Fire. The Stone Fire, which started Sunday evening, burned 340 acres and destroyed one home and six outbuildings. 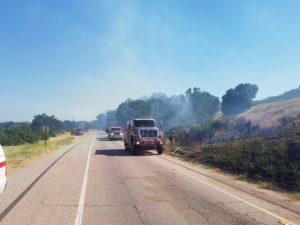 On Tuesday, five separate blazes, collectively dubbed the Spring Fire, sparked along Highway 101 between Atascadero and San Miguel. The Spring Fire burned a total of about 15 acres. It was caused by hot vehicle exhaust particulate from a passing vehicle that spread into vegetation, according to Cal Fire. Investigators have yet to release preliminary causes for the larger Parkfield, Alamo and Whittier fires. The Parkfield Fire burned 1,816 acres between San Miguel and Parkfield and is now fully contained. Both the Alamo and Whittier fires are still burning. The Alamo Fire has burned 28,687 acres east of Santa Maria and is 78 percent contained, as of Thursday morning. The Whittier Fire has burned 12,263 acres near Lake Cachuma in Santa Barbara County and is 48 percent contained.